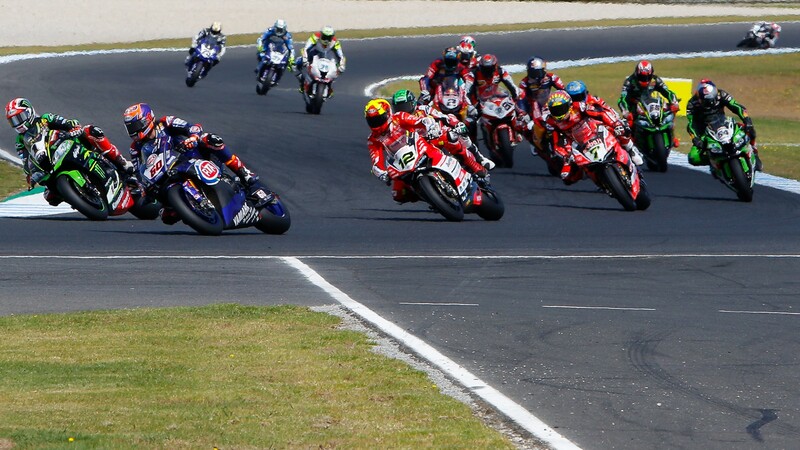 City of happiness to bring glory for WorldSBK? Destination of Speed awaits the MOTUL FIM Superbike World Championship, as they head to Thailand and the well established circuit in Buriram, as 4.5km of sweeping tarmac prepares to welcome the 19 WorldSBK riders, for what is set to be a sensational second round of the season. Marco Melandri (Aruba.it Racing – Ducati) arrives in Thailand as the championship leader, breaking Kawasaki Racing Team WorldSBK’s Jonathan Rea’s string of 76 races at the top, but the fight isn’t over and reigning world champion Rea will be the man to beat around Buriram. The battle for glory in Thailand is on! Melandri will be looking to take his third consecutive win when the lights go out on Saturday, as the Italian heads to Thailand as the only WorldSBK victor of 2018. The 35 year old is preparing for a tough fight, and after narrowly missing out on a double podium finish last season, he will be looking to improve his pace – especially through the tricky final corner in Buriram. Whilst Chaz Davies (Aruba.it Racing – Ducati) has a mixed bag of results from Thailand – including two podium finishes – he will be searching for a more positive weekend in Asia. Kawasaki Racing Team WorldSBK are no doubt the bench-mark around the Asian circuit, with an 100% win record in Buriram. Jonathan Rea took the double victory when SBK® first visited the circuit back in 2015, whilst Tom Sykes (Kawasaki Racing Team) joined him on the podium in race one. 2016 welcomed an 100% podium record for the duo following sensational British battles on track, of which Rea was the victor in Race One and Sykes in Race Two. Whilst 2017 welcomed the unstoppable Rea on his way to his third consecutive title, as he took the double in dominant style – closely followed by Sykes. Will 2018 see the end to their Thai reign? There are plenty on men on a bid to stop them. 2016’s pole position man Michael van der Mark (Pata Yamaha Official WorldSBK Team) will hope to put the opening race of the season behind him, as he suffered a tough first outing in Australia. But with a strong history around Chang International Circuit, the Dutch rider sets his sights on his second podium appearance in front of the hordes of fans, his first back in 2016. Fellow Buriram podium finisher Alex Lowes (Pata Yamaha Official WorldSBK Team) will be keen to get his YZF-R1 on the podium in Thailand, and he will be keen to remain in the top five of the championship standings after Round Two. Impressing with their new rider line up for 2018 in Australia, Red Bull Honda World Superbike Team of Leon Camier and Jake Gagne will have another challenging weekend ahead of them. Sitting in sixth position overall in the standings, Camier will be hoping to improve his overall record around the 4.4km circuit, where he has struggled in the past. With a new bike and team, the British rider will be putting everything he learnt from his first race with the CBR1000RR to good use this weekend. Whilst for Gagne it will be another track to learn, giving him even more of a test for the three days ahead. Milwaukee Aprilia team-mates Eugene Laverty and Lorenzo Savadori don’t have many happy memories of Chang International Circuit, which they will be looking to rectify for the 2018 MOTUL Thai Round. Italian Savadori has welcomed two top ten finishes here, whilst Irish hopeful Laverty has only competed here once, and took home one point from both races. With some big steps with the set-up of the RSV4 RF made in Australia, there will no doubt be two determined Aprilia riders around Buriram. Jordi Torres (MV Agusta Reparto Corse) has a strong record from Buriram in the past, as the Spainish rider has never finished outside of the top eight over all six appearances. Continuing to learn the dynamics of this new team, as well as the characteristics of the F4, it will certainly be a challenge for Torres but with the added confidence of the strong history – including two top four finishes in 2015, he will be one to watch. With their sole rider of Loris Baz making his debut in Buriram this weekend, the GULF ALTHEA BMW Racing Team will have a big challenge on their hands. Keen to get the weekend underway, the French rider will be keen to put in plenty of laps on his S 1000 RR throughout the start of the weekend as he prepares to get himself in the best possible position for the weekend ahead. Whilst the battle between the Independent Rider’s roars on into Thailand, of which Xavi Fores (Barni Racing Team) is dominating. Taking a podium finish in Australia and sitting in fourth position in the overall championship standings, the Spanish rider is the clear outstanding independent rider so far. However, with a mixed record around the circuit he will no doubt face some strong challenges from his fellow Independent Team’s and Riders. Follow the WorldSBK riders on their search for glory around the Destination of Speed from 23rd to 25th March, all with the WorldSBK VideoPass. With live sessions, build up and exclusive interviews you will be able to keep up with all the action, as racing kicks off at 16.00LT (+7 GMT) on Saturday and Sunday respectively.